The Phillies want to see Scott Kingery start using his speed along with his bat. 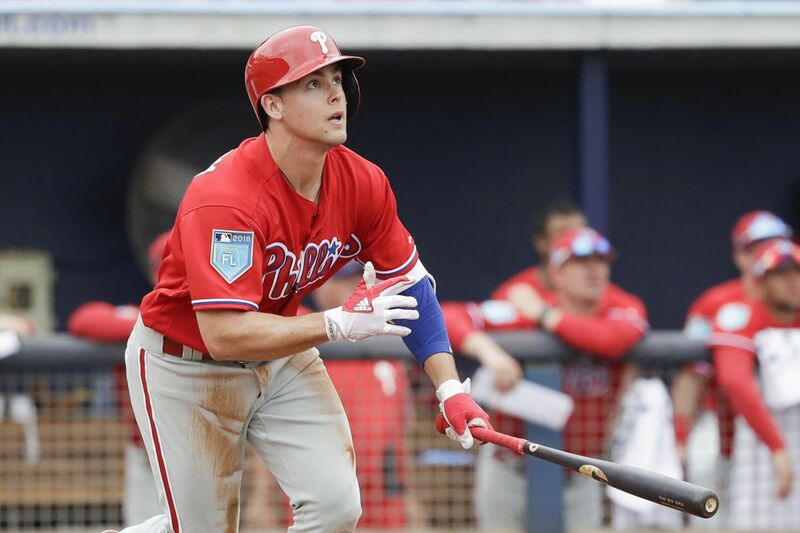 CLEARWATER, Fla. – Scott Kingery scored from first base during a crazy play in college five years ago and had a new nickname before even returning to the dugout. He was no longer Scott Kingery, the University of Arizona's freshman walk-on. He was Scotty Jetpacks, the aggressive runner who could wreak havoc on the base paths. The nickname stayed with Kingery during college and has followed him through the minor leagues. He even made it his Twitter handle. Kingery has turned heads this spring with his homers and defense, and there is little doubt he will reach the majors sooner rather than later. It is his speed — and that jetpack — that the Phillies are working to unleash before he arrives. "The most important thing for him is to trust his speed," said first base coach Jose David Flores, the baserunning instructor. Kingery's 29 steals last season were the second most by any player in the Phillies system. He thought he had chances for more but was too tentative. He would take a lead and overthink as he debated if it was the right time to steal. It was then too late. The Phillies want Kingery to find that trust. Take chances and be aggressive, they said. Kingery needs to find that trust. And he can find it this spring by taking chances. Gabe Kapler has asked his baserunners to "push their limitations and find out where their edges are." The runners will be rewarded for pushing themselves, Kapler said. "It's just not doubting yourself," Kingery said. "If you think twice about it, you're going to shut it down and not end up stealing. As long as you trust your speed and trust your reaction and first step, that's what you go off of; if you double-think about it then you'll end up shutting it down. You start thinking, 'Should I go or should I not?' It's usually better just to trust your speed and reaction and go for it." Kingery met with Flores before Sunday's game and the coach passed on the tendencies of Toronto pitcher Marco Estrada. Flores had dug through Estrada's video and mined data. They know how long it took for Estrada to throw to the plate and what pitches he likes to throw in a certain count. They found ways to exploit the pitcher. Kingery singled off Estrada in the first inning. And he knew exactly what to do. He stole second on the first pitch, perfectly timing the pitcher's delivery. "That's huge for him to be able to anticipate and get a feel for what the pitcher does from the moment he gets to first base," Flores said. "I think he's going to be successful. He just has to realize when he's on base that he's a threat to the other team." Flores said Kingery has the ability to steal 45 bases. Kingery agrees. Kapler said Kingery can be "a very successful" and "very efficient" base stealer. He does not want Kingery to focus on the number of bases he steals but the rate that he is successful and how he picks the time to steal. Just two Phillies players — Ben Revere and Jimmy Rollins — have stolen 45 or more bases in the last 20 years. The Phillies are willing to be aggressive for Kingery to reach that mark. Flores has told him he should try to steal third, something Kingery said he has never tried. The coach showed him video of Cubs infielder Javier Baez stealing third and told about the techniques Freddy Galvis and Chase Utley used. Kingery has the speed, Flores said, but he often gets content when he reaches second because he knows he can score on a single. Kingery is willing to give it a shot. "We want him to be a little bit more aggressive with one out," Flores said. "If we can get to third base with one out and the hitter early in the count, we'll take advantage of that and hopefully be able to score a hell of a lot more runs. The problem is that he's only hit homers this year, so we haven't had a chance to actually work on it." Kingery's speed, Kapler said, gives the team flexibility. If he reaches third, the Phillies can trust him to run on contact, knowing Kingery is quick enough and has the ability to get a good jump to score on even a ground ball. And if there's a play at the plate, Kingery will know what to do. He scored on that play in college after moving to third base on a single. The hitter took a wide turn at first and prompted a throw. Kingery dashed for home and slid past the tag. A nickname was born. "One of my teammates was like, you look like you turned on the jetpacks out there," Kingery said. "I didn't plan on running with it, but a bunch of people started calling me it and I thought it would go away by the time I got here. I can't remember who brought it up here, but all the coaches and coordinators found out and it just stuck."